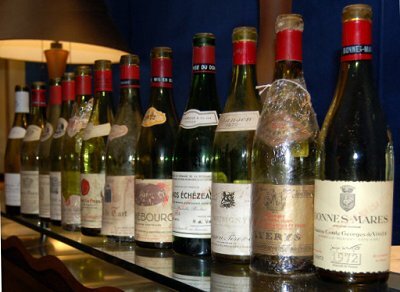 In March 2009 there was an extraordinary tasting of 1972 red Burgundies, organised by two regulars from wine-pages’ UK Wine Forum. Linden Wilkie is a New Zealander now living in London, and the man behind finewineexperience.com, and Keith Prothero who is a major supporter of the Pebbles Project in South Africa. Linden arranged this tasting, mostly of wines from his own cellar, as a charity fund-raising event for Pebbles. Pebbles is the official charity of wine-pages and the UK Wine Forum, where several regulars of the Forum are now involved as official volunteer workers and fund-raisers. For this dinner Linden arranged the private dining room at London’s superb The Square restaurant, and each attendee had to bid for a place at the table. My thanks to Linden for an amazing evening and one of the tasting highlights of the year so far. See stockists of 1972 Burgundy on wine-searcher.com. A touch leafy and brackeny, with hints of coffee and brambly fruit. There’s a lovely suggestion of woodland and truffle. There’s a touch of truffle and still some nice cherry fruit on the palate, though the acidity is marginally prominent, this is quite delicious in a lean style. 89/100. Second bottle 90.